Transform a wedding plan into a successful bakery business. "I love Katy and Bob: Cake Cafe! It's fast and fun, and has a lot of different cakes and foods to sell. I love fast-moving restaurant games like this and I'm glad I bought it. You will be too!" Katie and John are preparing for their wedding, but there is nowhere to order a wedding cake on the island. With the help of Bob, our heroes can solve this problem and create a cake-baking business for special occasions while they're at it. Transform a wedding plan into a successful business surrounded by colorful locations, exciting levels and jolly characters. Upgrade your team, earn trophies to suit any taste, and enjoy simple gameplay for any age. 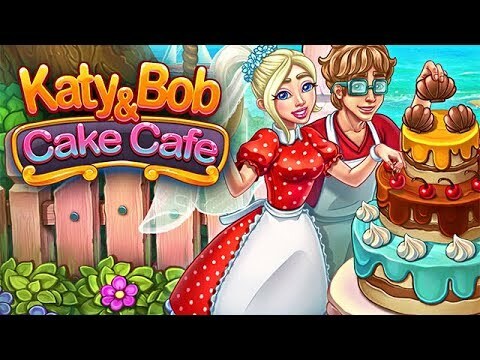 Featuring 60 exciting levels, bonus buildings on every level, and a captivating plot, Katy and Bob: Cake Cafe is a delicious adventure. If you like Time Management or any of the Katy and Bob series, you will love this game! If you have ever played Cake Mania or the like, this is definitely the game for you. If you have never played any of those games, then you need to! I found the game very engaging. It has excellent graphics and an attractive color scheme. Playing the game is therapeutic. This is very similar to the Cake Mania games and gets difficult pretty quickly. I would have liked it to ramp up a little slower. This game is very addicting with many hours of fun. I like these types of games and usually play all of them.